We’re sad that Halloween has come and gone this year, but here’s the thing: the passing of Halloween means that the holiday season is just around the corner! From the excitement of tearing open wrapping paper to being stuffed to the brim with plenty of turkey, this season of sweater-wearing and jolly times truly is glorious. Our pumpkin patch near Chicago might be closed down for the season, but that doesn’t mean the fun has to stop right there. Focusing on the next upcoming holiday, your friends at Bengtson’s Pumpkin Fest are going to touch on several lesser-known things about Thanksgiving. Impress your friends and family during this feasting time with your knowledge about this longstanding holiday! Even though we’re pretty far out from next year’s pumpkin patch season, Bengtson’s is going to spend the time in between getting ready and making Illinois’ favorite pumpkin patch better than ever before. 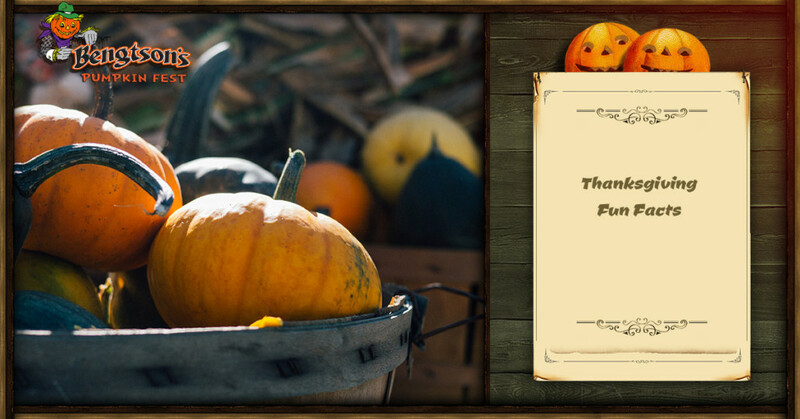 Stay up to date with our pumpkin farm by frequently visiting our website. Our goal is that you won’t have to find a pumpkin patch ever again because you already know about our Homer Glen pumpkin farm. If you have any questions, please feel free to get in touch with us! Did you know that each year, there’s a presidential pardoning of a turkey? It sounds a little bit strange, but it’s true (after all, stranger things have happened). The lucky turkey is spared from being eaten from Thanksgiving dinner each year from the current U.S. president. We’re not exactly sure why this turkey tradition exists, but the first turkey pardon ceremony started with President Truman back in 1947. Not too long ago, President Obama pardoned a whopping 45-pound turkey named Courage, who actually flew to Disneyland (the turkey, not Obama) and served as Grand Marshal of the theme park’s annual Thanksgiving Day parade! Why is it that Thanksgiving is on the fourth Thursday of the month? This was actually decided by President Abe Lincoln, but it’s unclear as to why he choose this particular day of the week and time of the month to dedicate this holiday. In 1939, President Roosevelt moved it up a week in hopes that it would help the shopping season during the Depression era. This never caught on, and the date of Thanksgiving was changed back only two years later. One of the things that people commonly associate this turkey-fueled holiday with is the famous Macy’s Thanksgiving Day Parade, a massive event taking place in the heart of New York City. The parade, as it is known today, began back in 1924. It started with 400 employees (a small parade but a large amount of employees, to be sure) marching from Convent Ave to 145th street in New York City. While no large balloons were at this early holiday parade, it did feature an array of live animals from Central Park Zoo. Why are football and Thanksgiving so closely associated? Well, for one, eating massive amounts of delicious food pairs incredibly well with watching America’s favorite sport (sorry, Baseball). The NFL actually started the ‘Thanksgiving Classic’ games back in 1920, and since then the Detroit Lions and the Dallas Cowboys have hosted several games on Turkey Day. In 2006, a third game was added to the mix with different teams hosting the event. What on Earth does Thanksgiving have to do with Thanksgiving dinners? It’s not like people are eating TV dinners during this festive feast, right? Well, TV dinners can actually credit their existence to Thanksgiving. Indeed, in 1953, the Swanson food company had so much extra turkey leftover from the holiday (a massive 260 tons of it!) that a clever salesman suggested that they should package it onto aluminum trays with other sides like sweet potatoes. Voila, the first TV dinner was born! Depending on how fancy you and your family are, cooking in such a great amount of bulk actually lowers the overall price of the feast. Though there’s a lot of food being made, the cost of an average Thanksgiving dinner for 10 people is only around $50! At only $5 person (nothing short of a bargain), this is another thing to be thankful for. Minnesota is the top turkey-producing state in America. In fact, six states consisting of North Carolina, Arkansas, Missouri, Virginia, and Indiana account for nearly two-thirds of the mind-blowing 248 million turkeys that are raised (on average) every year. While that’s the number of turkeys that are raised, there are about 280 million turkeys that are sold for Thanksgiving, which equates to 7 billion pounds of turkey and approximately $3 billion worth of sales. If you’re the presidentially-pardoned turkey we mentioned above, you must be feeling pretty lucky by now. There are some places in the United States that are so excited about Thanksgiving that they are actually named after the popular holiday’s main course, turkey (have we mentioned turkey enough in this blog?). With Turkey, Texas; Turkey Creek, Louisiana, and Turkey, North Carolina on the U.S. map, it’s fair to say that these places are always in the Thanksgiving spirit. It’s pretty well-known that eating massive amounts of turkey can make you sleepy afterward (or eating massive amounts of any kind of food), but many people don’t know why this is the case. It’s because of an amino acid called tryptophan, however, the levels of tryptophan in turkey are comparable to that in other meats. Realistically, the reason people get tired after Thanksgiving is due to the large intake of carbohydrates and the subsequent release of melatonin in your body, causing you to feel sleepy. Stay Festive With Your Favorite Illinois Pumpkin Patch! We’re a long ways out from Halloween at this point, but with the holidays around the corner and the exciting things we have planned for next year’s pumpkin patch near Chicago, there’s a lot to get pumped about! Stay updated from our Halloween pumpkin festival in Homer Glen.